It’s crazy how quickly six days go by; I had no idea it had been that long since we’d posted anything. 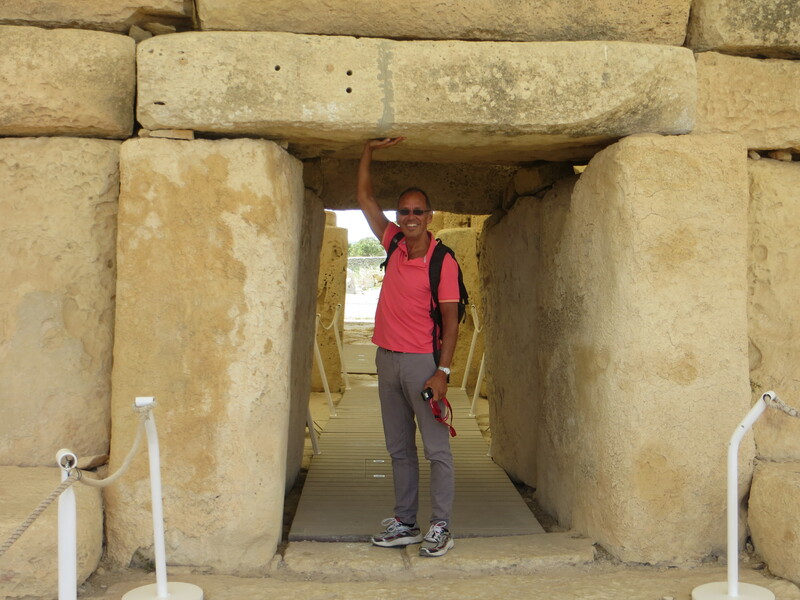 And pretty eventful days they were: from Nefta out in the dessert we made two different stops in Djerba, an island in southeast Tunisia, another night in Tunis, and then off to Malta, the 26th country of our adventure and my 81st country ever. Here are some highlights. 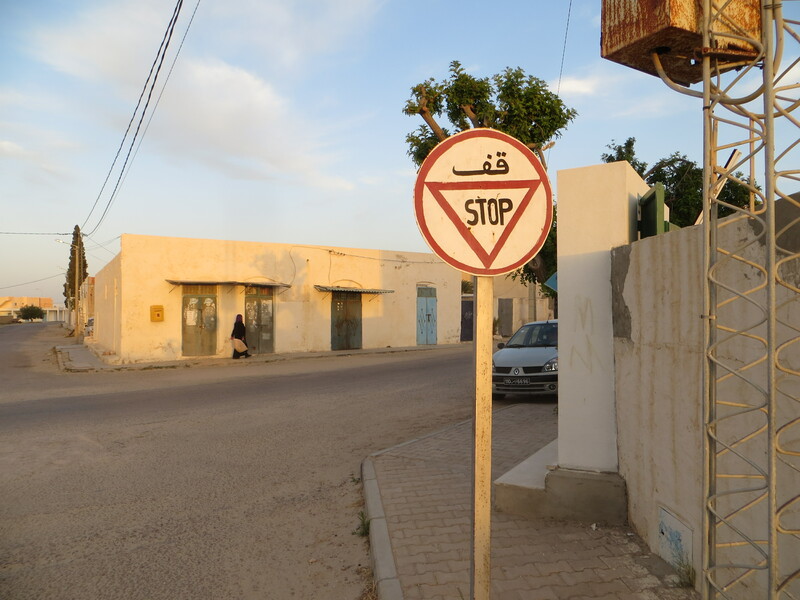 Our first stop after our time in the dessert was the tiny town of Er-Riadh on the island of Djerba. There’s really not much there except two draws: the oldest synagogue in Tunisia and perhaps all of North Africa, and a very cool hotel and restaurant. Now, by “oldest” synagogue they don’t mean the building itself is old; in fact it’s pretty modern (more on that in a second). 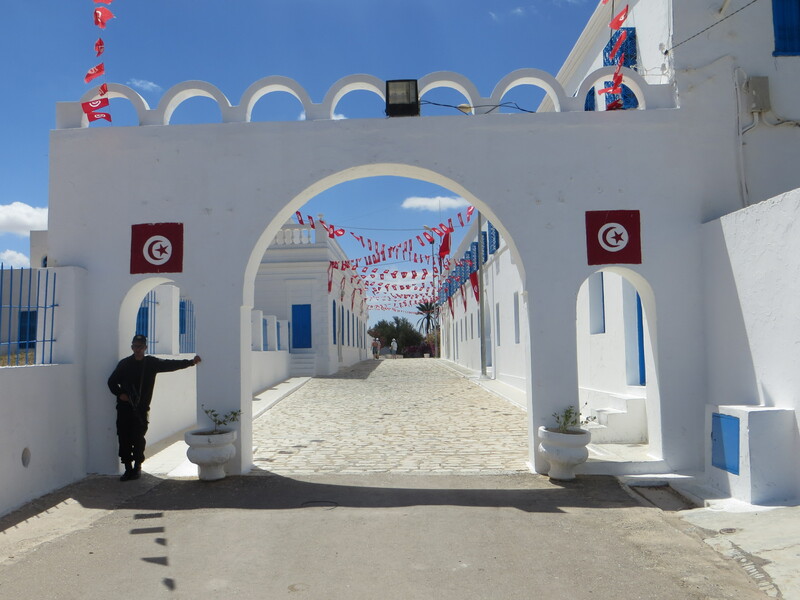 But the site dates back a couple thousand years and it’s still the site of an annual pilgrimage for Tunisian Jews that was just starting when we were there. Security in the area was pretty phenomenal; lots of heavily armed police and military personnel, and lots of traffic stops. While I was out for a morning run one day I saw a local pickup truck that apparently didn’t know there was a traffic stop on his regular route: I heard him slam on the brakes and could smell the burned rubber and, as I ran past, saw his tire on top of the bed of spikes meant to stop people from running the stop. Obviously it worked. Entrance to the synagogue. This armed guard was after we’d gone through security and all that. The need for security is an awful story. In 2002 someone bombed the synagogue during the annual pilgrimage, killing somewhere around 20 people. Maybe they thought that would prove whose religion rocks the most or something. At any rate, now there’s a lot of security. 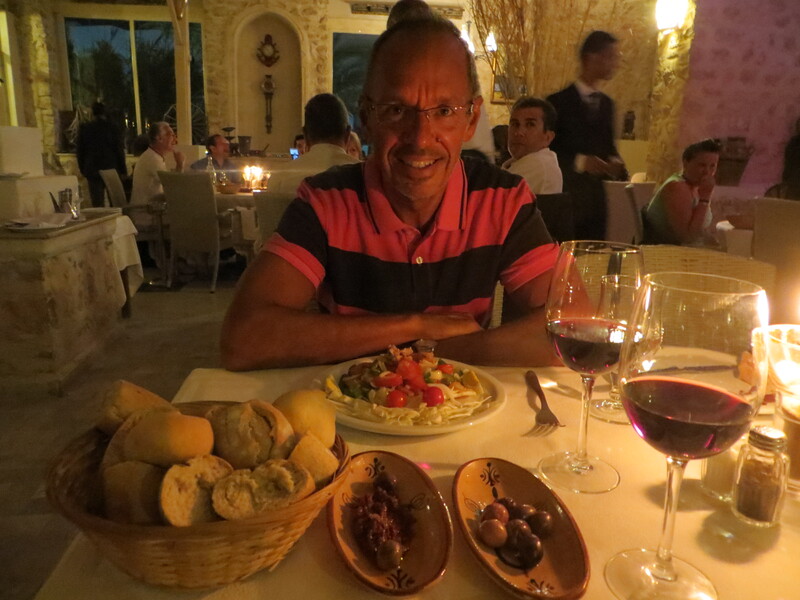 One of the highlights of Tunisia was the food. Some of the local salads were phenomenal, and always plenty of olives and harissa when you sit down. Even the local wine was good! Next stop was down to the beach. Not much to say and no pictures to post. Tunisian beaches are for big, big hotels and they’re just not the kind of places Mark & I like to stay in. It was beautiful but still pre-season, meaning it was empty. Cavernous and empty. And too cold to go in the water. A nice little break, but ultimately not very interesting. Then two days ago we flew into Malta. We’d originally wanted to take a boat, and Lonely Planet said it was possible, but Lonely Planet is apparently out of date. So we flew in and have pretty quickly fallen in love. It’s a tiny country – it’s one-tenth the size of Rhode Island – but packs a bunch of great sites. So far we’ve explored Valletta, the smallest national capital in the EU, and took a bus around part of the island today. 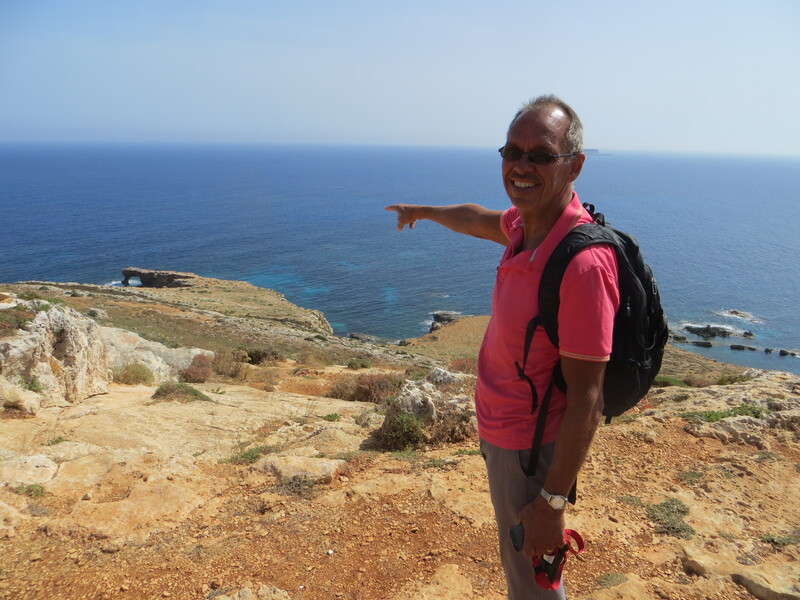 Tomorrow we’ll do another bus to see more of the island and then we’re headed to Gozo, the second island in the country – the really small island – and then off to Sicily. Hard to imagine that in eight days we can cover an entire country but like I said it’s small. 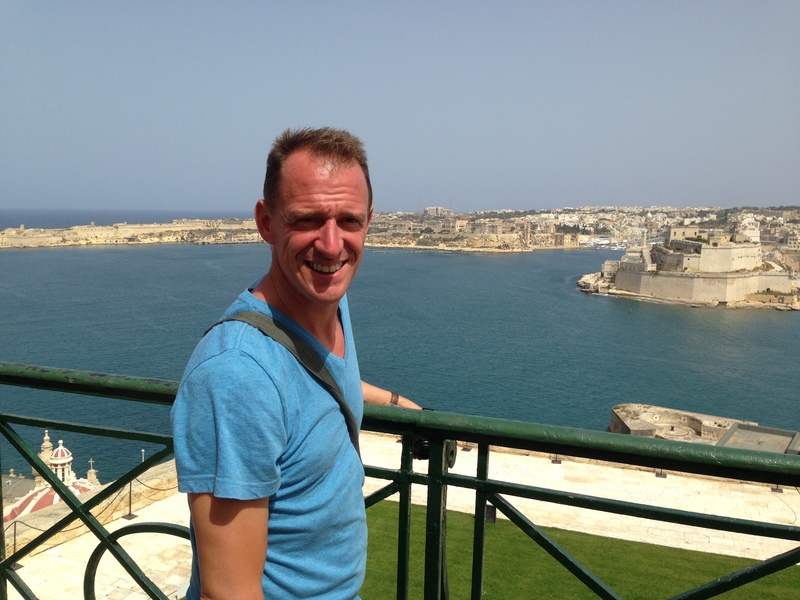 In our two days here we’ve fallen in love with Malta. Gorgeous bays and inlets, beautiful architecture, even interesting history. 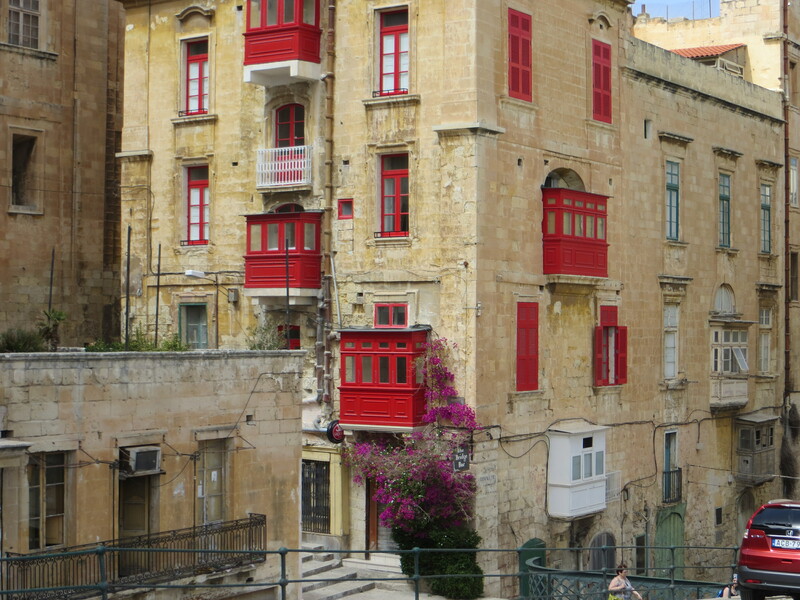 The buildings are all made of stone this color, but they add great color in the window bays! Our adventure today included a tour of Malta’s Inquisitor’s Palace, where the Inquisition was centered here. We learned that they were really just missionaries trying to help the locals live more Christian lives. 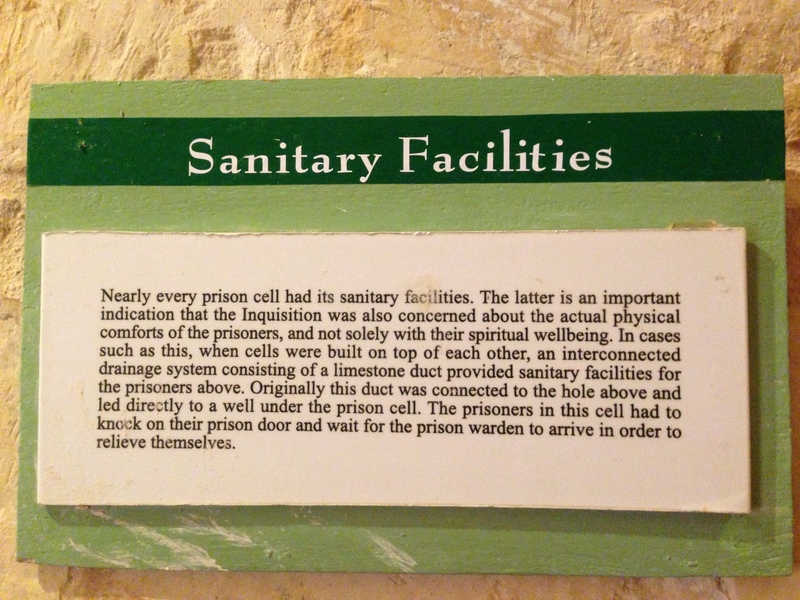 Torture was rare and they really cared about the health and comfort of people. Really. That’s what we learned. 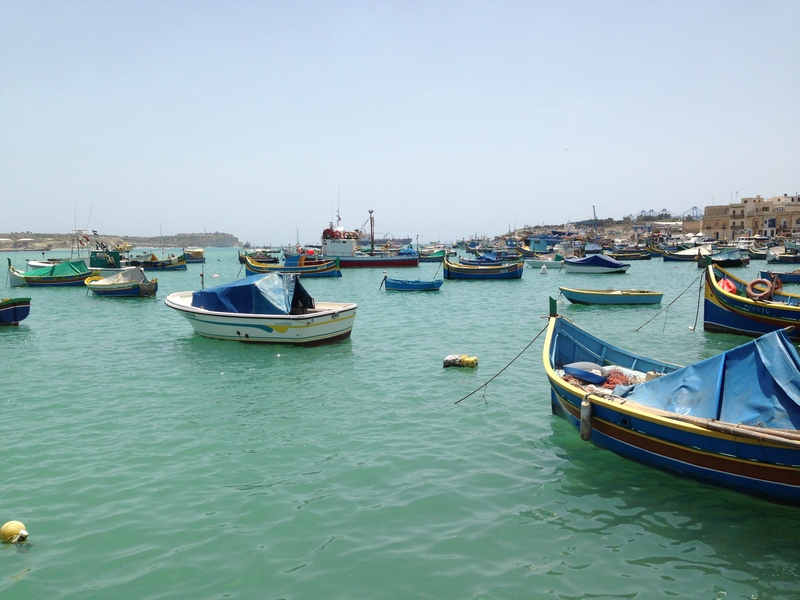 Lunch was in this too-perfect-to-believe fishing village. Fish soup, octopus, swordfish carpaccio, and sea bass between the two of us. All spectacular, with good, local, and cheap wine. It doesn’t get much better! 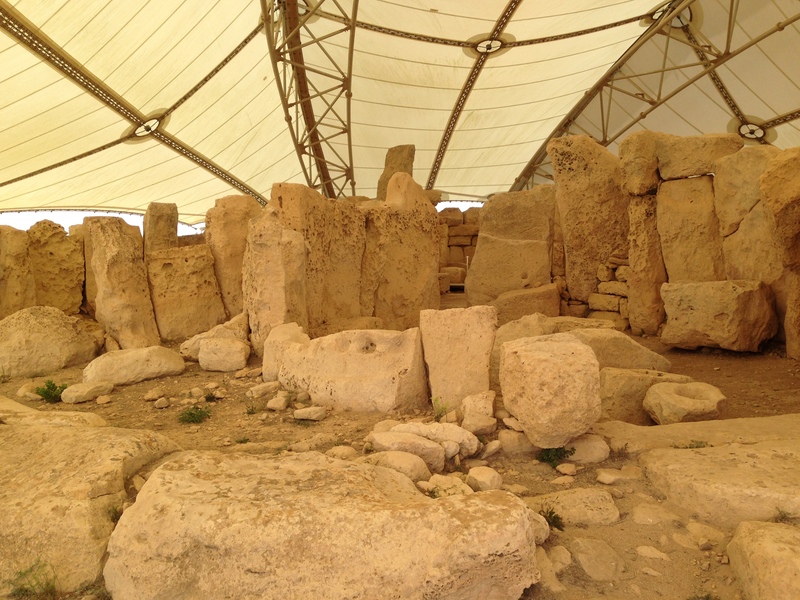 Our bus ride today took us to the Hagar Qim Temple, a nearly 6,000 year old pile of rocks that may be the oldest human structure on earth. Big rocks! And finally, this. Everything that could be wrong with a Martini. Either shaken or on the rocks, not both. 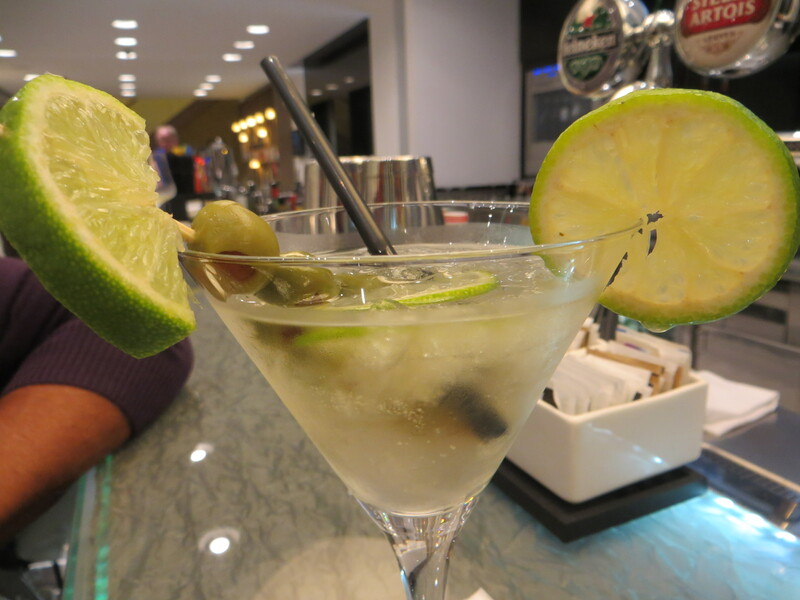 No citrus – not on the glass, in the glass, or on the stick with the olives. And definitely not all three. And no straw. Ever. Next to the old ruins, this was the view. I should be down there reading but we ran out of time. Here we are, traveling the world for the rest of our lives, and we still don’t have enough time! !